This is a day to remember all those who have made sacrifice for others. Take a moment today to remember those who went to war — some never to return, others returning whole or broken; both inside or out. 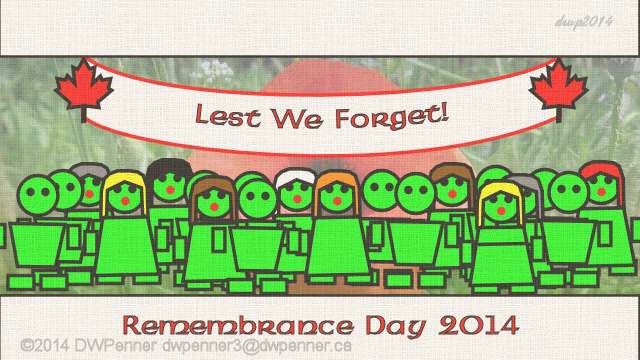 Remember too, in addition to the soldiers, the peace keepers, the first responders and others that keep us safe. Also remember their parents, grandparents, spouses, siblings, children, grandchildren, and all who loved them and miss them. We might agree or disagree with the wars that have happened, but regardless of that soldiers place their lives on the line for us. Let us not forget their sacrifices. This entry was posted in Cartoon Strips, Special, Specials, Writer's Words and tagged 11 11 11, Cartoon, Cartoon Strip, Comic, Comic Strip, Darrell W Penner, DWP, DWPenner, Giving, Gnome, Gnome Tapestry, Gnomestead Tapestries, Gnomestead Tapestry, Gnorman, Gnorman the Gnome, Lest We Forget, November 11, Remembrance Day, Tales, Tapestry, Tapistry, Veteran's Day, Writer's Words by DWPenner. Bookmark the permalink.